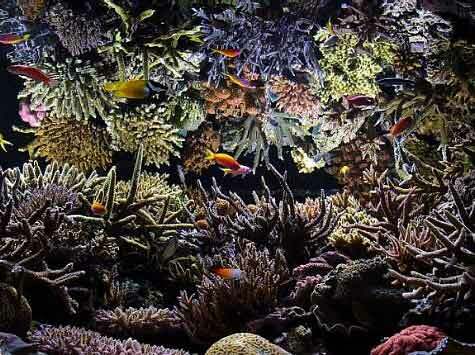 What a great honor it is for me to have my reef tank featured here in Reefkeeping Magazine at Reef Central, together with the other awe-inspiring Tanks of the Month that I have always envied from afar! Speaking of afar, I hail from the beautiful tropical island of Singapore, where cosmopolitan lifestyles are hectic, where a car costs as much as a house, where visiting 'The Great Outdoors' necessitates a plane trip out of our concrete island city, and urban fun is usually defined as a trip to the malls or cinemas. 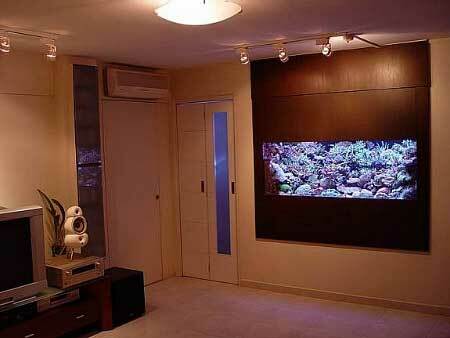 It is no wonder that aquarium-keeping is a popular way we locals keep ourselves sane! I started in the hobby with freshwater tanks, keeping everything from cichlids to planted tanks. 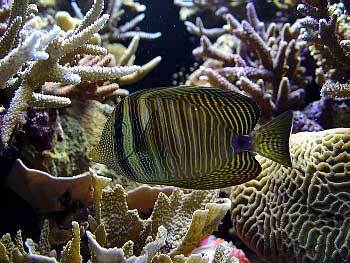 Having a close affinity for the marine environment, (I love marine documentaries, snorkeling, scuba diving, underwater photography, and offshore fishing, and I worked for a cruise company and was in the Navy), it was no surprise that I took up the reefkeeping hobby. 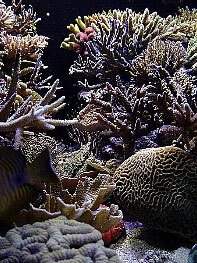 I started with a marine tank in the year 2000 when I got the keys to my new home after marrying my lovely wife, Serene. We still remember our first tank fondly, as we both took a week to recover from bodily aches after struggling to carry the old dirty 118-gallon monster home ourselves! (Well, it was free and we were broke then!) 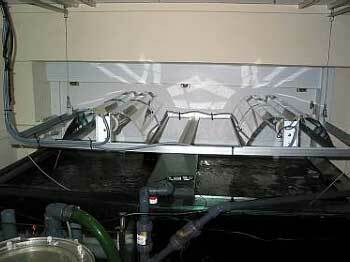 I still wince in embarrassment when I see photos of my first marine tank. 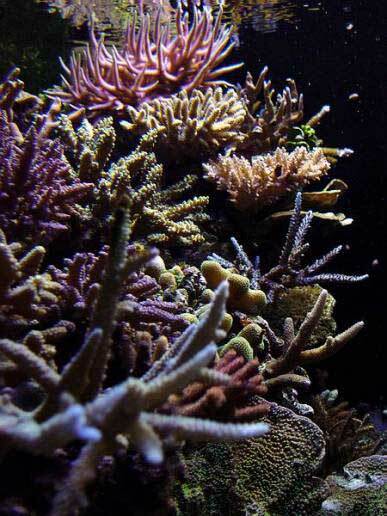 It was poorly aquascaped and lit with just two flourescent tubes, not to mention being sparsely stocked with soft corals, sponges and fishes that kept dying. I wonder now, with the same wonder I have when I see my current tank, how I spent so many hours looking at my marine tank back then! Visits to the local fish shops resulted in me buying more and more stuff that didn't work. The hole in my wallet got bigger and bigger with no corresponding improvement in my tank, which led me to suspect that something was amiss. The big smiles I received from the local fish store employees every time I walked in didn't help! 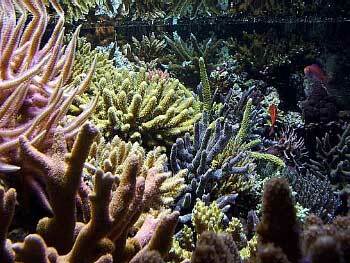 Thank heavens, I got on the Web and found Reef Central! 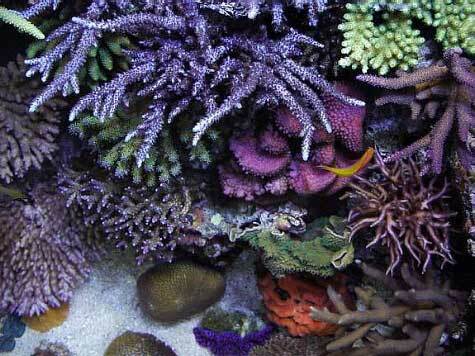 It was here that fellow hobbyists, who freely share their experiences and knowledge, have instilled in me the concepts of responsible reefkeeping and have taught me the importance of knowledge gathering, with its correct application being directly proportional to the success of the reef. 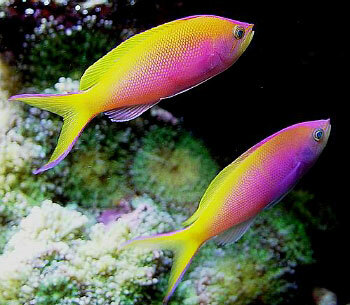 I endeavored to better my reefkeeping abilities, and to a certain degree, I was successful. 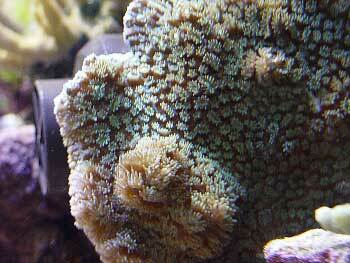 I kept mostly large-polyped stony corals back then. My old tank prospered by leaps and bounds, and it was beautiful enough to get the thumbs-up from most RC reefkeepers and numerous visitors to my home. The old tank, however, was badly scratched, very narrow (only 1.5' wide), had leaky seals and took up valuable space in the hallway. The droning chiller under the stand that constantly blew hot air at us was a major irritant. After many months of research, I re-evaluated my tank and decided that I wanted to upgrade to a bigger, better reef-ready tank with all the modern reefkeeping methods and setup tips that I had learned. I decided on an in-wall design concept for the new tank, with a façade that framed the glass sides and covered both the deep sand bed and the top edge of the water's surface, creating a built-in plasma TV effect. For easy access during feeding and maintenance routines, I incorporated a swing door over the tank into the façade, which I painted a dark wenge color, to better integrate with my home's interior design. The new tank would sit in the spare room behind the wall and, because space was no longer an issue, I decided on a three-foot width, which excited me with all its landscaping possibilities as I was constantly frustrated with the old tank's narrow width. The other positives were that I could now hide all of the equipment from view, and the light, noise and heat would no longer spill into the hallway. Because the tank is designed to be viewed only from the front, I invested in expensive Starphire glass for the front pane. To this day, I have no regrets, as I believe that this helps to show the true colors of my corals, clams and other reef inhabitants without imparting the greenish tinge of ordinary borosilicate glass. 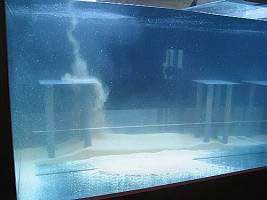 On September 17, 2002, my new tank was finally completed and I transferred all the existing live rock, livestock and water from my then two-year-old tank into the new one, which is effectively twice the size of the old tank. 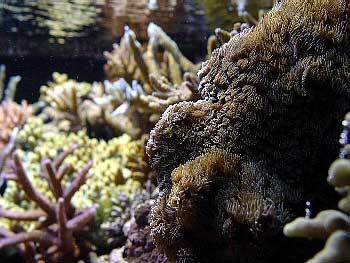 I kept mostly large-polyped stony corals during that third year and battled cyanobacteria, hair algae and Bryopsis algae during the maturation phase of my new DSB. Two mishaps later, after the tank overheated when I was out of town, causing the partial loss of most of my LPS corals, I decided to begin keeping SPS corals, but only after installing a thermal protection system to safeguard the livestock against any future mishaps. for this shot, so mostly blue light illuminated the tank). My dream tank is now an SPS-dominated coral reef tank that took many months to fill with life, and today it's the proud centerpiece of my home! Full front view (click to enlarge). 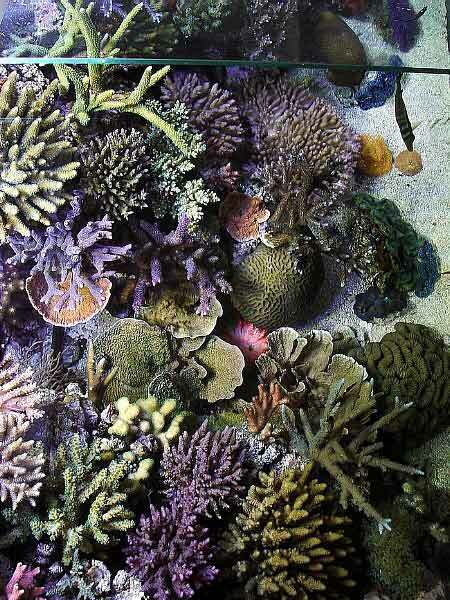 Before setting up the tank, I spent a lot of time looking at actual reefscapes from diving magazines, photos from Jen Veron's Corals of the World reference books, as well as harvesting from the memories of my own diving experiences for inspiration to create a natural-looking reefscape for the tank. I began by separating the rock structures into two parts, creating the illusion of a swim-through area between two reef walls. 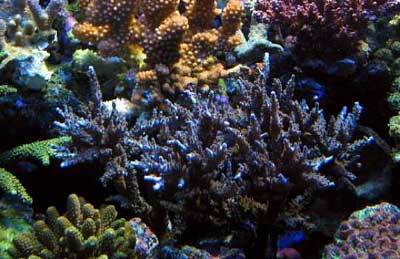 I filled the 'sea floor' between the crevice created between the walls with plating Montipora spp. 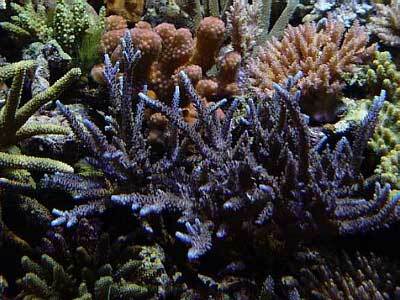 corals and various gorgonians. This natural effect is accentuated by fishes that swim through the back cave channel, then appear suddenly in the 'canyon,' only to disappear and reappear again somewhere else! I maximized the sandbed's biological filtration efficiency by leaving it approximately seventy percent uncovered. I achieved this by constructing grey PVC reef racks, which are basically just two PVC sheets welded together to form the base and the shelf with PVC pipes as the legs. This not only creates a very strong structure for aquascaping, but its low-profile means the reef structure contains many caves, and leaves unobstructed swimming space for my fishes throughout the whole back and sides of the tank in the areas behind the rocks. 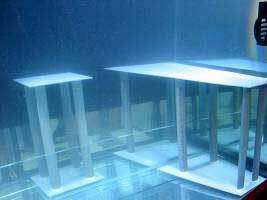 I purposely avoided using white eggcrate typically used for reef racks as it is flimsy, sharp-edged, harder to camouflage and takes up more space, and reduces the swimming space available for the fish. I wanted my reef to appear as natural looking as possible so I endeavored to hide as many foreign-looking elements as I could. I therefore built the overflow box externally, which not only freed up space inside the tank but also meant that my reefscape would not be interrupted by an artificial-looking internal glass box structure. I chose black as the background color as it provided a needed sense of depth. I siliconed a black acrylic sheet to the back wall, and I purposely made it shorter so it stopped one inch away from the sandbed, in order to facilitate viewing from the rear. 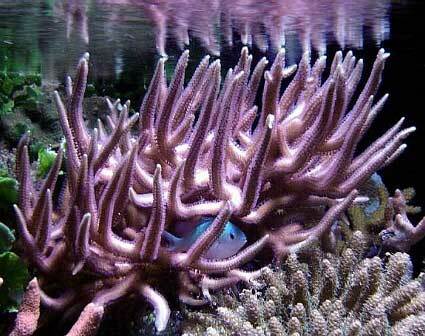 Unfortunately, coralline algae completely foiled my intentions by quickly covering the rear viewing panel! The use of the PVC reef racks allowed the live rock from my old tank to completly fill the new tank. I didn't want too many rocks anyway as I envisioned the SPS corals filling up the empty spaces instead. 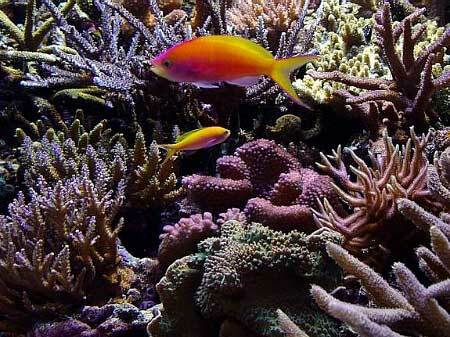 a representation of a vibrant, natural-looking coral reef. A front view showing the water surface's reflection (click to enlarge). 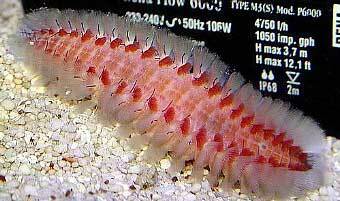 I am using a deep sand bed, which gradually slopes from six inches at the back down to four inches at the front of the tank. I was able to achieve a consistent six-inch depth for roughly one-third of the substrate volume by installing a glass divider, which prevents the natural settling processes that, over time, would have caused it to appear level. 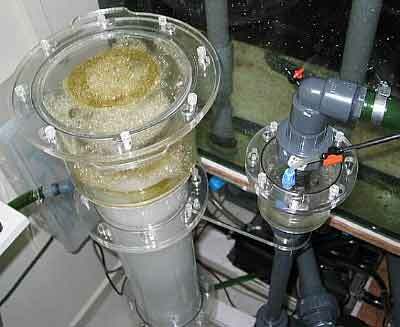 The DSB performs most of the biological filtration for the tank as I did not want a lot of live rock in the tank. 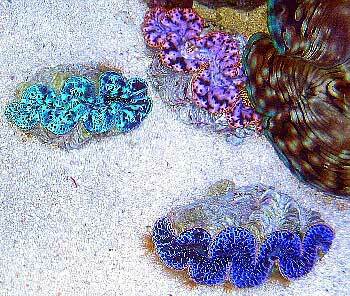 The two resident sea cucumbers perform a great service by constantly turning over the sand bed's surface. 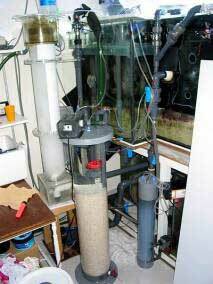 I am using a do-it-yourself Beckett skimmer that stands one meter tall and has a six-inch reactor body that produces a hefty, sludgy skimmate. Future plans include upgrading to a double-headed Beckett version with an eight-inch reactor body. 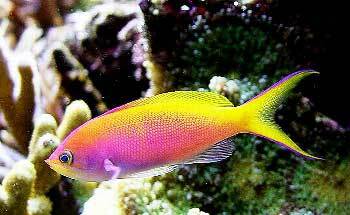 As I intend to keep more Anthias in my tank, the bioload will undoubtedly increase due to their requirement of frequent daily feedings. I use a mixture of Contraphos and Rowaphos in a do-it-yourself fluidized reactor, with Reefez granular activated carbon in another reactor. current size in a few months! Insofar as I wanted to create a natural-looking reef with all 'alien' elements (such as circulation returns and wave making devices) out of sight, I used an external overflow box, a closed loop, and carefully hid most of the in-tank equipment with creative rock and coral placements. For water circulation inside the tank, I upgraded from Reeftecs to my current Tunze Streams (a 6080 and a TS12 model) and will probably add a few more Streams as the reef grows and needs supplemental circulation. 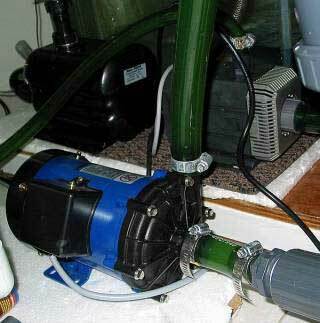 I use an Iwaki MX-70 pump as the main circulation return pump, which also drives the Beckett skimmer. 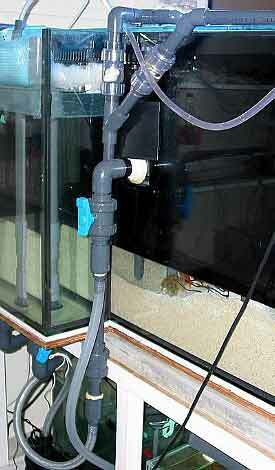 An Iwaki MX-70 pump drives the Beckett skimmer and main returns. A closed-loop, connected to an Eheim pump and a 1.25 hp Titanium chiller, ensures that the tank remains chilled, even if the main return pump fails for some unexpected reason or if the sump is taken offline for servicing or cleaning. The lights are on timers which come on at 4PM and go off at 1AM daily. The 20K bulbs are the first to come on and the last to go off. When I decided to begin keeping SPS corals, I wanted intense lighting! 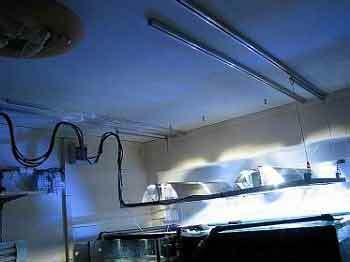 I sold my Aquamedic Aquasunlight 150 watt x 2 double-ended metal halide pendant and upgraded to a total of 1600 watts of metal halide lighting. I chose 6500K and 20K color temperature metal halide bulbs with the idea of combining the best of both their respective attributes: the reputed fast growth rates from the Iwasakis and the wonderful coral coloration provided by the 20K bulbs. I built a rail system for my lightweight DIY light rack (made up of aluminum 'L-bars' riveted together) to mount the four reflectors. I can easily push this whole light system completely away from the top of the tank for easy maintenance. The Iwasaki bulbs are side-by-side at the back of the tank and the Ushio blue bulbs are side-by-side along the front. Together, they blend well and give an intense, natural white look with no visible banding due to the placement of the reflectors. 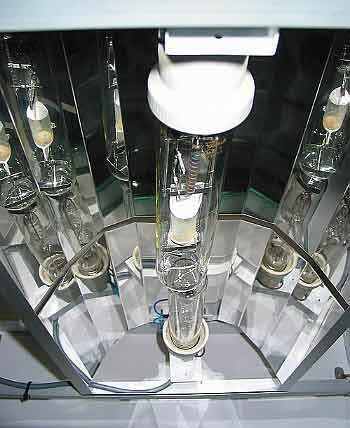 A photo showing the bulb placement described above. Unfortunately, two major overheating episodes occurred within the past few years when I either stupidly forgot to switch on the chiller pump, or the metal halides stayed on continually due to timers which were not designed for such a heavy load. After being out of town for a few days, coming home to an overheated tank containing bleached, stressed or dead corals left me determined to get rid of 'Mr. Murphy' and his Law of 'whatever can go wrong WILL go wrong!' 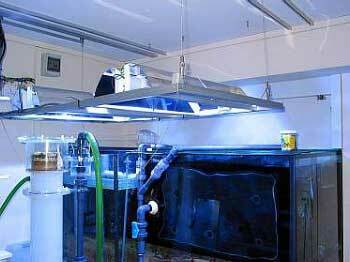 I have since installed a thermal protection system consisting of a thermal probe in my main tank designed to cut power to the metal halides once the tank temperature reaches 29°C. I would much rather come home to a dark tank than to a boiling tank with 'cooked' livestock. Using high quality contactors and timers helps ensure that no more overheating episodes will ever happen due to cheap timers sticking. Water changes of approximately twenty-percent are performed every two months. Sometimes, when I extend the water change interval, I dose some QFI trace elements or magnesium, iodine and strontium to supplement what my calcium reactor can't provide. I don't use filter floss, nor do I use bioballs in the sump, so maintenance is minimal. I clean the skimmer collection cup only once every week, and wipe the salt creep off the center brace and the metal halide reflectors every month. 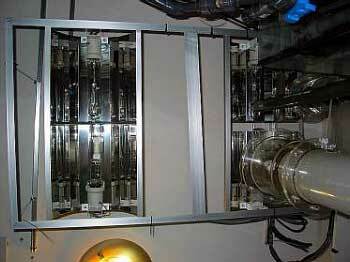 Calcium and alkalinity levels are maintained with a do-it-yourself calcium reactor, based on a popular German design. It stands almost four feet high and contains roughly 26kg of CaribSea A.R.M. media. My DIY Beckett skimmer, DIY calcium reactor and kalkreactor. For the occasional boost of calcium and alkalinity levels, I now use Reefez Calcium Plus and Alkalinity Plus. An automatic T.U.B.B.Y. water top-off device maintains the salinity level , and this seems to be an effective and safe way of dosing kalkwasser when used in conjunction with the kalkreactor. Additionally, water top-offs with kalkwasser are performed nightly to help boost the pH. 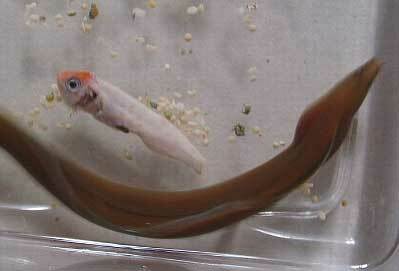 The fishes feed about five times daily on a combination of Cyclop-eeze©, frozen Mysis and brine shrimp, Ocean Nutrition Formula Two pellets and various other flake foods, as well as Nori obtained from the local supermarket. The SPS corals are fed daily or every other day with Golden Pearls of different micron sizes and with Liquid Life's Coralplankton. They get live rotifers when I have time to resume my culturing regime or when I'm fortunate enough to receive some from fellow hobbyists. I see substantial growth of my SPS corals and attribute that partly to the feeding of zooplankton/phytoplankton substitutes. I also dose either DT's live phytoplankton, Liquid Life's Bioplankton or my own home-cultured Nannochloropsis phytoplankton to the tank. The explosive growth of sponges, tiny tubeworms, tunicates, various 'pods' and other micro life in my tank apparently corresponds to this provision of phytoplankton. 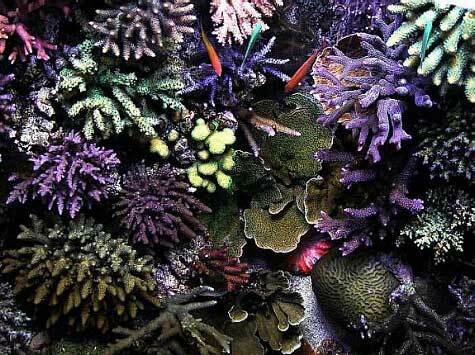 The tank houses roughly 72 small-polyped stony colonies and fragments, consisting mostly of Acropora, but also Pocillopora, Astreopora, Hydnophora, Stylophora, Porites, and Montipora sp. 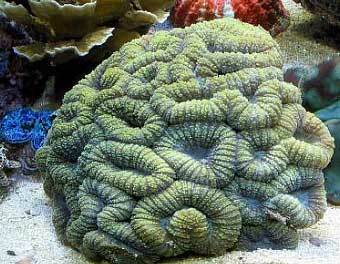 The large-polyped stony corals number around 14, and consist mostly of various brain corals, Scolymia and Blastomussa sp. 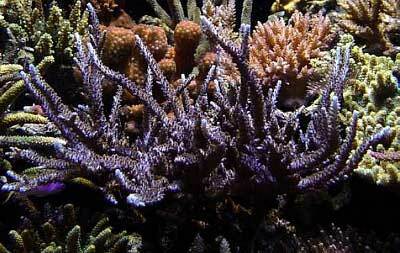 Soft corals include a rapidly growing white pulsing Xenia colony, green star polyps, several Ricordea yuma and assorted gorgonians. 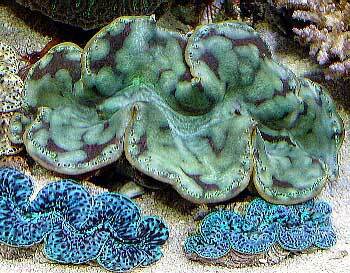 Additionally, five T. maxima clams and one T. derasa clam make this tank their home. 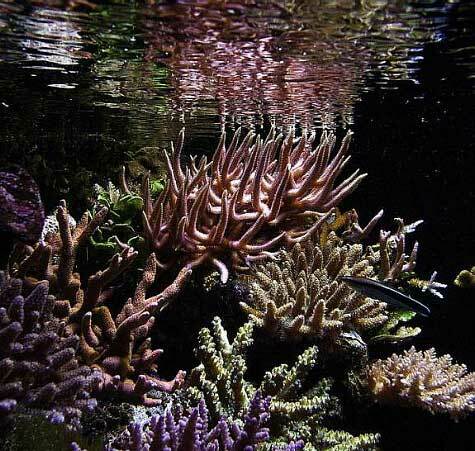 I still have much to learn about SPS keeping and it's interesting to observe how different corals adapt to different lighting regimes, various water flow patterns and how they react to each other when territorial disputes arise. 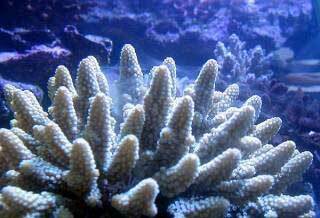 Some of my more fascinating experiences were seeing a Pocillopora coral 'burn' an Acropora staghorn, learning that Seriatopora hystrix could hurt Pocillopora and that a brain coral and staghorn can maintain a 'no man's land' between them. It was, indeed, an eye-opening event to see my two yellow A. humilis spawn simultaneously. This blue staghorn, photographed on 9/10/03, was about a year old after having grown from a three-inch fragment. The same blue staghorn photographed on 2/13/04. And now a month later on 3/21/04! An important lesson I learned is never to underestimate the toxicity of dead flatworms, and that it can bleach or darken certain corals (most of the pictures here are post-Salifert Flatworm Exit treatment with most of the Montipora spp. 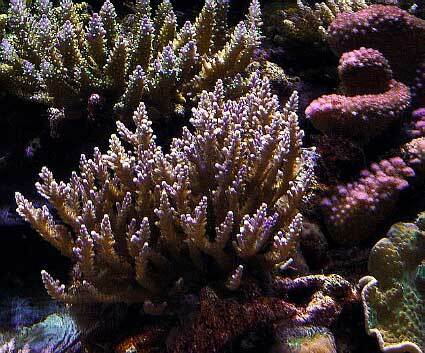 corals and my pink table Acropora having been affected). 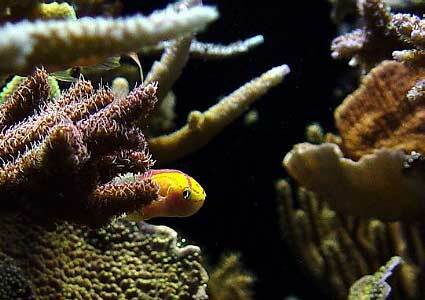 simultaneously in my reef tank. 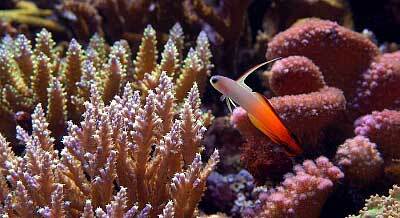 I also learned that a large Porites coral with Christmas Tree worms can also contain hitchhikers which can eat an Anthias a day! 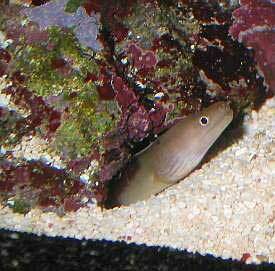 I spent a week of sleepless nights trying to catch and remove a juvenile brown moray eel hitchhiker! 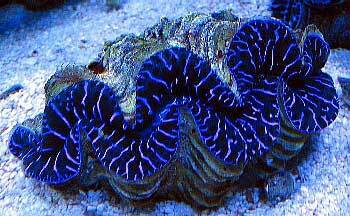 A fellow reefkeeper then quickly adopted it before I relished evil thoughts of turning it into a Unagi sushi dish! The hitchhiker that killed my school of Dispar Anthias. The guilty party reveals damning evidence!. 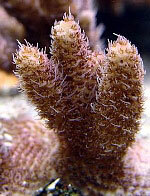 purple-tipped Acropora sp. is visible at the top. 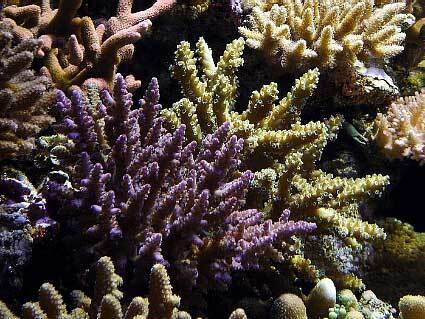 Assorted Acropora colonies with orange Montipora digitata at the top left corner. shot, so mostly blue light illuminated the tank). My thanks go out to fellow Reef Central members who taught me almost everything I needed to know about modern reefkeeping. 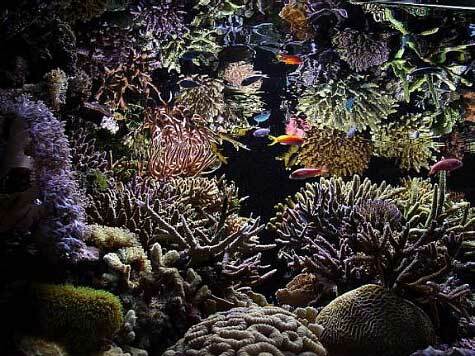 I would also like to thank three local reefers, Robe, Morgan and Tanzy, of the Singapore Reef Club (www.sgreefclub.com) who have unselfishly shared their personal experiences and knowledge, and inspired me to excel in the art of SPS coral keeping.